Hardcover (10 x 11 1/4), Editions Limited, Honolulu, 2003, FIRST EDITION (stated). 171 pages. Lavish color photos, vintage photos. Clean and tight with minor movement of spine hinge, moderate edge and corner wear and rubbing, dustjacket edge curl, mild crease, repaired tear, scratches, flaps intact. 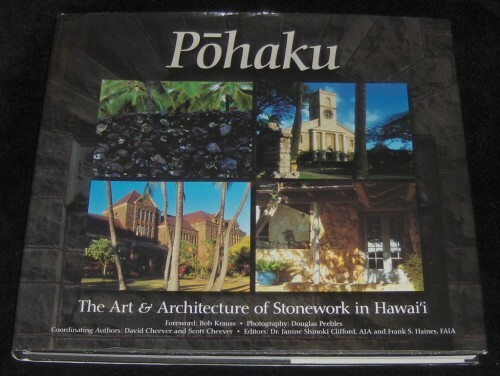 "In this volume we have collected about 100 pohaku, or stone, structures in Hawaii whose stories are told by more than 50 essayists. Many are Hawaii's leading architects. Others are journalists , historians, archivists and those who simply love stone architecture. Most of the stone structures have interesting stories behind them... Some of the stories are spiritual, others are amazing and some you may find amusing..."